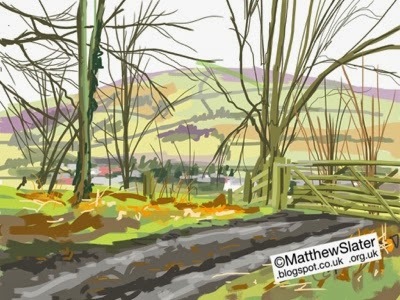 Some sketches made around Sowdley Wood that streches along the southern side of the Clun Valley between Clun and Clunton in South Shropshire. 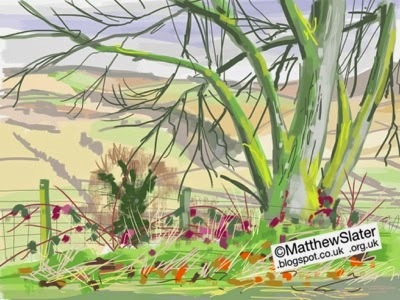 These were sketched just above Clunton on cold hazy mornings when the colours were quite muted. 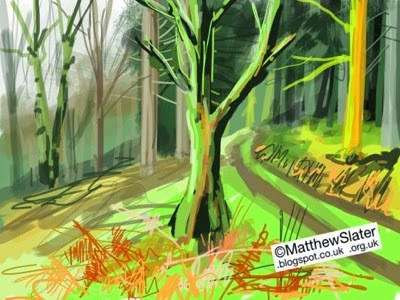 The third sketch, high up in the woods on the edge of a thick conifer plantation was sketched whilst sheltering under an umbrella. The joy of using an iPad is that it can tolerate a little more dampness than a sketchbook can. At this time of year the oranges of dead leaves, bracken and that of the algae that grows on the shaded sides of tree trunks can be quite striking. 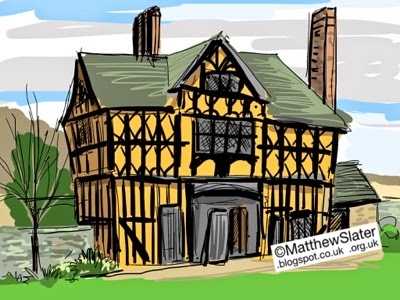 Quick sketch of Stokesay castle gatehouse near Craven Arms, Shropshire. 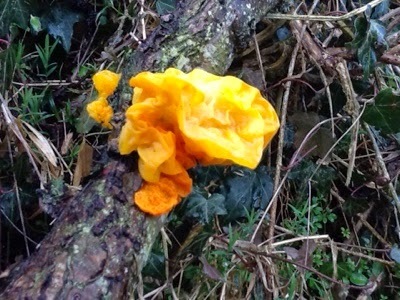 Wonderful example of yellow brain fungus found growing in a hedgerow above Clun. Such a stunning colour. 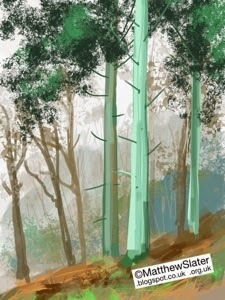 This was a sketch made between rain showers of some pine trees in Sowdley Wood near Clun. They had been planted amongst a mixed stand of conifer and old oak woodland and stood alongside some redwoods. 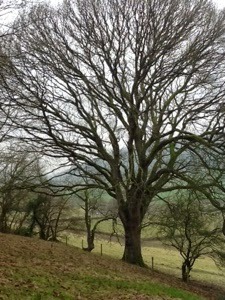 Both types of tree towered high above me and looked spectacular even on a dull and wet day. I have spent quite a while trying to identify this particular tree but haven't quite found anything that exactly matches what I have seen. What struck me was the gorgeous pale turquoise colour of the trunks that stood out in the dim light. I am often struck by how intense colours can be in nature even when there is very little sunlight. The bark was very smooth and with fine horizontal markings but very little cracking except at the very base of the trees. One rather interesting feature on all the trees was a diagonal stripe on the bark that curved very slightly anticlockwise by about 5 or 10 degrees, approximately 10ft long and beginning 20ft up. I wondered if this was a mark made by some protective covering of the young saplings when they were originally planted, but I don't really know. Judging by their height they must have been planted early in the last century as they looked far grander than stands of commercial conifers that are grown nearby. After a little scrambling about on the step hillside I did find the remains of some very large fir cones and, as they don't match those of the redwoods or other nearby Douglas firs, they must come from these trees. Even after an extensive Internet search I cannot exactly match them to anything. I could be missing something fairly straightford and I am a little annoyed at not being able to name them but I do like an occasional puzzle like this. I've awoken to a perfectly clear pale grey-blue Sky with a bright creamy horizon silhouetting the distant charcoal hills over which the sun will shortly appear. It looks like there has been a light frost. The past few days have been cloudy and hazy with few distant views to be had. Yesterday Afternoon saw a change with April-like showers and brief bursts of sunshine. 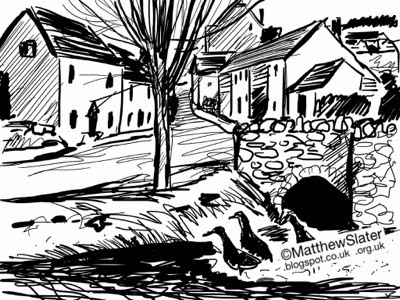 Outside the wooden lodge where I ams staying a blackbird sings boldly above the continuous sound of the tumbling river. As the light improves so the definition of the landscape increases. The hills of Sowdley Wood, Purslow Wood, Radnor Wood and Clunton Hill form steep sides to the River Clun valley. The hills quite abruptly give way to the broad flat expanse of the sheep pastures that line either side of the river. 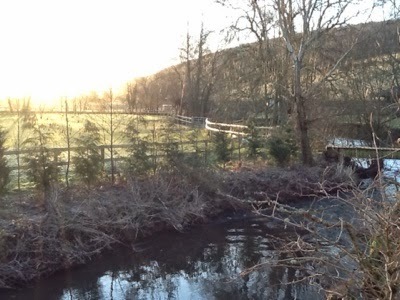 Alders and willows line this meandering stretch of water that carries water down from the Welsh hills. The river is probably about two meters below field level here but the whole nature of the area; the flatness of the fields, the close proximity to hills and the fact that the lodge I am staying in is raised off the ground by a metre or so is a good indication that the whole area can be prone to severe flooding. Looking out towards Clunbury hill a couple of miles away, it looks like the sun will rise almost directly behind the trees on its summit. The sunlight of this new day will highlight the hills around me first and then the bottom of the valley a few minutes later. I go and get my daughter out of bed and together we sit watching as the light intensifies and then the bright and increasingly dazzling sun fills the landscape with light. My father loved this landscape and I too am deeply drawn to it. It has certainly felt fairly spring-like here. The temperature has been cool, but not cold. Snowdrops are everywhere in gardens and around human habitation. I've found wild honeysuckle full of small leaves in sheltered hedgerows and numerous other plants are definitely spying the initial touch of spring.